Will seniors downsize and relocate? My colleague Richard Green noted that he saw a good presentation from Irina Telyukova on whether elderly households will downsize for the sake of downsizing. I’d like to get a copy of Telyukova’s paper, as this is a particularly thorny problem for transportation. There is a great deal of faith in the planning world that the aging of America (and western Europe/Australia) will boost up public transit, as eventually seniors give up driving. Sandi Rosenbloom has a couple of nice papers which discuss this issue [1,2]. The news is not good. Past trends suggests that as we get older, we stay put. We age in place, until we can no longer manage on our own, at which point the decline comes quickly. Part of this has to do with a discussion that Richard and I had: he and his wife have worked very hard; they are both professionals; they are very successful, they have raised their children, and yet they bought a house they really really really love even though it’s technically too big for them. I am reminded (as I am often) of my friend David Forkenbrock, who built his dream home–a fantastic place he loved so much that outside offers couldn’t blast him out of the University of Iowa despite the ghastly winters. These seem reasonable enough things to want to enjoy into your latter life. Why not? A place for the grandkids to stay, for the kids to use for long visits. 1. Boomers have to date been the most mobile and global generation; they’ve had money and comfort and a great deal of political power due to their numbers. They may have less need to rely on their housing for equity than previous generations of seniors due to their wealth, and they may have less concern over the transactions costs of moving, again due to wealth. However, these are all factors that may, in fact, allow them to age in place more readily as they may be able to afford homecare and lawncare and all sorts of services that make single-family home living easier when you get older. 2. Because of their wealth and their lower demand for services like schools, it may be that the TOD trend becomes more focused on retirement and lifestyle communities. Trust me; if my experience as a professional planner means anything, it’s that developers love residential density and neighbors hate it. If you can convince the neighbors that you’re moving in a bunch of old dears who won’t drive, park, party or take up room in their kids’ classroom, density gets easier to build. See above comment about political economy. 3. Seniors may be particularly responsive to new taxes, which I think we will see, that make suburban living relatively costlier. They may not be, but they may be. All that said, I think I’m stretching. It’s easier to drive than it is to take transit; if it weren’t, then all of these “transit and walking fight obesity” people can’t be right. As Rosenbloom points out, this generation of women, in particular, were far more mobile than their mothers. The numbers on transport side do not suggest that seniors are going do much different than they have before. S. Rosenbloom. 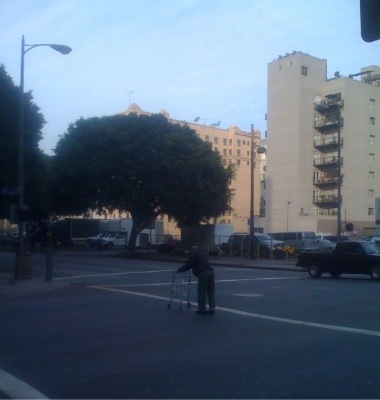 Sustainability and automobility among the elderly: An international assessment. Transportation, 28(4):375–408, 2001. Journal Article.